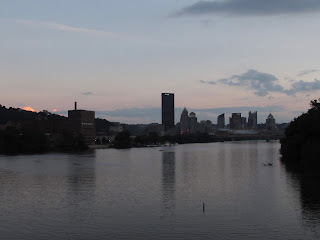 Due to Pittsburgh's setting, which straddles multiple river valleys, the hills surrounding the city enable you to get some excellent city views, vistas, and overlooks. There are so many different angles to get excellent views and photos of the city. Here is a list of more than 25 different places (in no particular order) that you need to check out. 1) The Lower Hill District - Former Civic Arena site, Boy Scouts Headquarters, and more. We will start off with one of the best, yet often overlooked areas, the Lower Hill District. The area of the former Civic Arena gives breathtaking views of the city skyline. When the old arena was planned, one of the concepts of the design was a retracting roof to enable spectacular views. When the roof was open, it provided a dramatic view of the Pittsburgh skyline, then dominated by the Gulf and Kopper's Buildings. When the arena first opened with its original tenant, the Pittsburgh Civic Light Orchestra, on July 4th, 1962, Carol Burnett put on one of the opening shows for the arena. She joked about the then-new facility, saying "It'll be a pretty nice place when they get the roof fixed." Future performers, including Leonard Bernstein, were harsher critics of having the roof open, and this novelty would eventually fall out of favor at the arena. While the arena is now long gone, the spectacular views of the skyline remain. In addition to the scenic views, you are almost certain to run into some wildlife, such as turkeys, deer, groundhogs, different birds, squirrels, and more, often visiting us as we sightsee at the park. This spot also holds the distinction of being the first beautification project of the Western Pennsylvania Conservancy, an organization formed to help alleviate unemployment through public works projects and to make the area a better place to live. The conservancy has gone on to create, preserve, and protect some of Western PA's most important regional assets, including Ohiopyle, McConnell's Mill, and a number of other lands that became state parks. The conservancy also aided Frank Lloyd Wright's Fallingwater, one of his most famous architectural works. 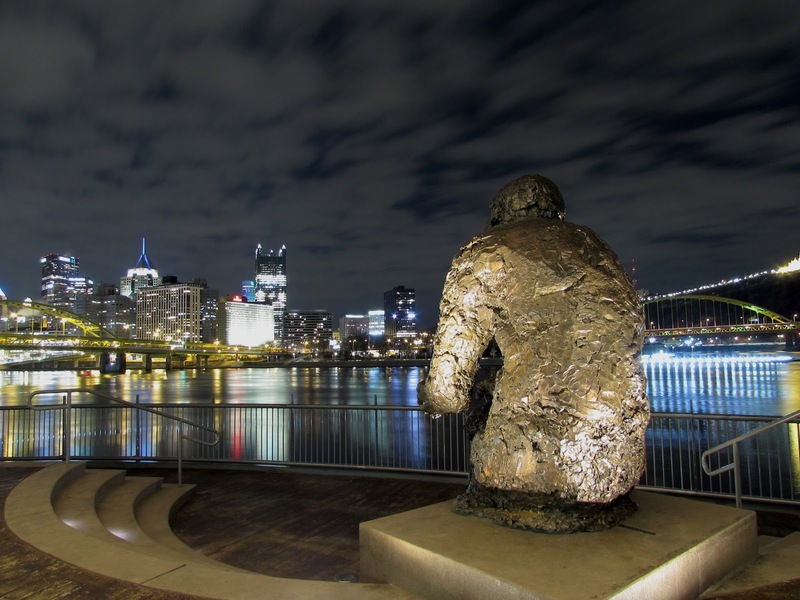 The organization's success with Frank Curto Park, their first major project, began a tremendous legacy that has continually improved western Pennsylvania. Pittsburgh's most famous scenic vistas can be found upon Mt. Washington. This vantage point is known worldwide and it gives one of the most complete views of the downtown area. Additionally, it is home to the Fort Duquesne and Monongahela Inclines, two of the best places to soak in views of the skyline. No matter how many times you go up Mt. Washington, you will be sure to see something different every time. Variations in the time of day, weather conditions, the city's events, and more, contribute to the dynamic views that you see here. Our first date consisted of riding up the Mon Incline, walking across Grandview Avenue, and going down the Fort Duquesne Incline, all on a blustery February evening. The walk across the top is roughly a mile long, and beautiful views of the skyline are seen in nearly every spot. A view from Mt. Washington's Emerald View Park. This area is home to some nice hiking trails up and down Mt. Washington. Located in the Elliott neighborhood of the city, the West End Overlook provides one of the most expansive views of the entire city skyline. Throughout Oakland, you are likely to be within feet seeing the Cathedral of Learning. The University of Pittsburgh's Cathedral of Learning is the tallest building dedicated to university education in the western hemisphere. The Cathedral's first three floors have thirty different classrooms dedicated to some of the cultures that have contributed to the growth of the city and the university. The Nationality Rooms are open to tours and even hold classes at the University. The lobby of this Late Gothic Revival building, known as the Commons Room, is three floors tall and offers tremendous views. It often hosts nationality festivals, college functions, and more. The 36th floor is the highest floor open to the public of any building in the city of Pittsburgh. Right near the building are the world-renowned institutions such as the Carnegie Museums of Art and Natural History, the Oakland branch of the Carnegie Library, the botanical gardens of Phipps Conservatory, Carnegie Mellon University, and more. The best way to see everything that Oakland has to offer is to simply take a walk through the neighborhood. On the Friday night of Pitt's homecoming weekend in the fall, they shoot fireworks off of each of the tiers of the building. If the Pitt football team wins, you will see the dazzling orange victory lights on top of the building. The jewel of Pittsburgh's park system, Schenley Park, is a paradise of its own. Schenley Park contributes to Pittsburgh's ranking as one of the most forested cities in the country. According to the US Forest Service, 42 percent of the city is covered in forest. Large hillsides that were once logged during the days of heavy industry, have since regenerated and created an urban oasis. Schenley Park is one such place to check out this beauty. Terrific views of the city are found at both Schenley Oval and Flagstaff Hill. Phipps Conservatory's botanical gardens are spectacular and a must-see attraction. It is located at the base of Flagstaff Hill. The Three Rivers Heritage Trail, Eliza Furnace Trail, and South Side Riverfront Trail, are Pittsburgh's main riverside bicycling and walking trails. These trails cover most of the riverfront areas in the city and provide endless opportunities for people looking to get great views of the city. These trails provide pedestrian and bicyclist access to many bridges that you would typically miss out on getting views from. The Herr's Island View on a much cooler morning. 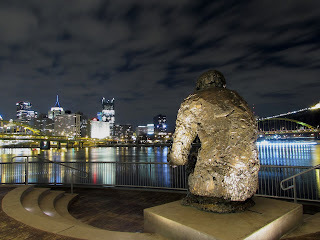 Heading down the Allegheny River to the start of the Ohio River, along the North Shore, will take you to a monument dedicated to one of my personal heroes, Mister Fred Rogers. This location delivers a majestic view of Mr Rogers' Neighborhood. A view from the monument at sunset. We follow the geese and ducks to our next stop. Locals generally think of parking and flooding whenever the Mon Wharf is mentioned, but alongside the river is a scenic walkway. Visible from this walkway is Station Square, an entertainment complex made up of the area of the old Pennsylvania and Lake Erie Railroad station. The Allentown neighborhood's Grandview Park is a great place to see the Pittsburgh skyline, with sweeping vistas of Downtown and Oakland. Station Square has a great view of the skyline, complete with an elevated viewing area. The Gateway Clipper Fleet sets sail from Station Square, and the journeys on their boats provide an intimate look at the skyline from the Three Rivers. If you are looking for a great date night, look no further than grabbing dinner and heading out on a Gateway Clipper Tour. 25) Mary Monument "Shrine of the Blessed Mother, Our Lady of the Parkway"
South Oakland's Mary Monument overlooks a busy section of the Parkway East, AKA Interstate 376. This site also overlooks the Pittsburgh Technology Center that sits on what was once the sprawling J&L Steel Plant. Several rumors exist as to why this was erected. One story says that the shrine was erected there after a deadly accident on the Parkway, which ended in this spot heading from downtown, prior to completion. Another story of its origin mentions a steelworker having a vision during a lunch break during a long shift at the old J&L Steel Plant. The family that erected the little parklet area does not mind you going into their backyard and checking it out. They have even set up some benches and a small altar at the site and excellent views of the city can be seen from this location. 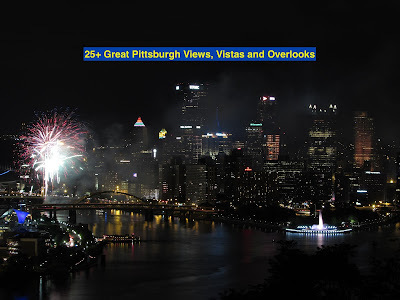 Consider our list to be a nice launching point for viewing the Pittsburgh skyline. Due to the geology of the region, there are countless places you can get a great view. Consider these to be a great starting point into your own explorations.